Motor Legends USA - Who is David Holzman? David Holzman learned to drive when he was six, operating the steering wheel and the gas on the '57 Chevy wagon under the tutelage of that great driving instructor, Dad. He learned to shift gears at age 9, on the '57 Plymouth - a car with monster fins, a monster clutch, and a bad case of body rot! 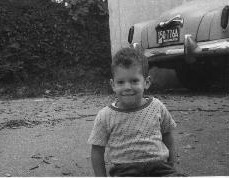 David's first car was this baby blue '62 Falcon, which hit 100,000 miles in Lovelock, Nevada on the way back to Boston from California when David was 18. David took his first trip across the United States, from Menlo Park to Boston, in this 1950 Studebaker, which had the characteristic bullet nose. David's father had been stationed in the USSR during World War II. He bought the Studebaker because Studebakers that had been sent to the USSR under the Lend Lease program were known for holding up extremely well despite bad roads and terrible winters. David's father says that the sturdy Studes helped break the ice between the Russians and the Americans, and that the name "Studebaker" became a synonym for excellence in both languages. David is also a bicycle nut, and rode a bicycle from Seattle to Boston after graduating from the University of California, Berkeley. David then became a medical, science, and automotive journalist, and writes for publications ranging from Smithsonian to the Journal of the National Cancer Institute. His article on Paul Russell, who restored Ralph Lauren's antique cars, appeared in The Atlantic Monthly. He is Journal Highlights Editor for the American Society for Microbiology. 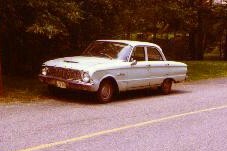 Several years ago, in a fit of nostalgia, David almost bought a 1960 Valiant. But ever practical, David realized what he wanted was to be able to look at that car's deco lines any time he wanted. So he photographed it. Photographing antique cars quickly became a habit, and soon friends were suggesting that he "do something" with all those photos. David's car art has been displayed at the American Inaugural Art Exhibit, Washington, DC, the Cafe Xando, and elsewhere. Now you can wear his art on a Motor Legends shirt. Check out David Holzman's photos on our Motor Legends USA shirts and prints.